Leader: Tonight is an important night. *To create a joyful sense of community and set a tone of celebration host a potluck, a meal, potato-taco-pasta, dessert or salad bar. The lesson plan will reflect a shorter timeframe to allow you to integrate this element. In Lesson 1 students wrote out their “biggest FAITH QUESTIONS” then sealed them into an envelope bearing their names. Tonight, pass out these envelopes. Allow a minute of two for students to silently read their questions. Leader: “Would anyone be willing to share how God has been working, revealing, or changing your questions and vision? Ask: “What do you believe that God is calling you to?” (*Leader: “I don’t know yet”…may be a valid statement. Encourage such persons and know that the Holy Spirit will speak to them). Be aware that some questions may remain. Physically place these “questions” in one stack to be prayed over. Have the group join hands, praying for understanding and for one another. Leader: Stress that our sincere questions before God draw us back into the Word and to God himself. He can handle the questions we live with. The Holy Spirit is able to work in and through us to confirm the truth of God’s presence. TIP: Any questions remaining may also guide the leader to connect this group into further Bible Studies. A Covenant is a solemn agreement. There are examples in the Bible where a pact is made between people and vows to keep these promises were considered binding for all time. Such a pact was made between Jacob and Laban (Genesis 31:44). When God promised Noah that He would never destroy the world again by flood, a vow was made (Genesis 6:18;9-17). God vowed his love, his leadership, power, blessings, and relationship to the Israelite people. In turn they were to live gratefully and obediently (Exodus 24:1-8). The book of Hebrews in the New Testament calls this “Old Covenant”. God sent the Messiah who was to come to rescue God’s people from their sins. God promised a new covenant based on forgiveness and the writing of his law on people’s hearts (Jer. 31:31-34). Jesus inaugurated this new covenant with his blood (Mark 14:24; 1 Cor. 11:25). He is the covenant which brings us new life. Over the past 9 weeks you have looked at doctrines of faith that help shape what the Salvationist believes. We are now moving towards the time you will sign the Articles of War as your own covenant with God. We begin with the basic understanding that those considering Soldiership and Adherency have asked Christ for forgiveness of sins and stand here, as miracles of grace. 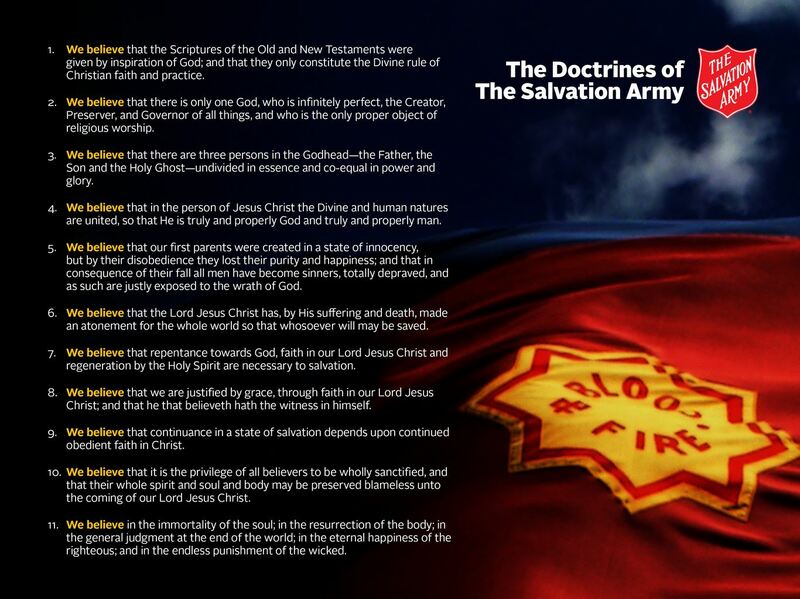 We have looked at each of these doctrines. Each week we have prayerfully made them our own. “I now call upon all present to witness that I enter into this covenant and sign these Articles of War of my own free will, convinced that the love of Christ, who died and now lives to save me requires from this devotion of my life to His service to the salvation of the whole world, and therefore do her declare my full determination, by God’s help, to be a true soldier of The Salvation Army. 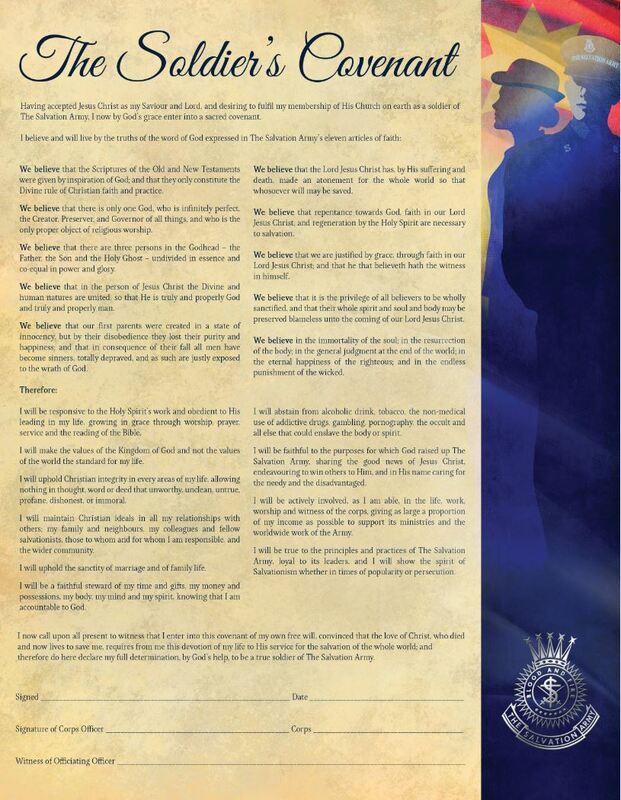 Within the Soldier’s Covenant there are some pretty straightforward declarations of obedience. Major Stephen Court discusses the Covenant with us. I urge you to read through the entire Soldier’s Covenant to discover the beautiful ways in which the holy life is expressed. 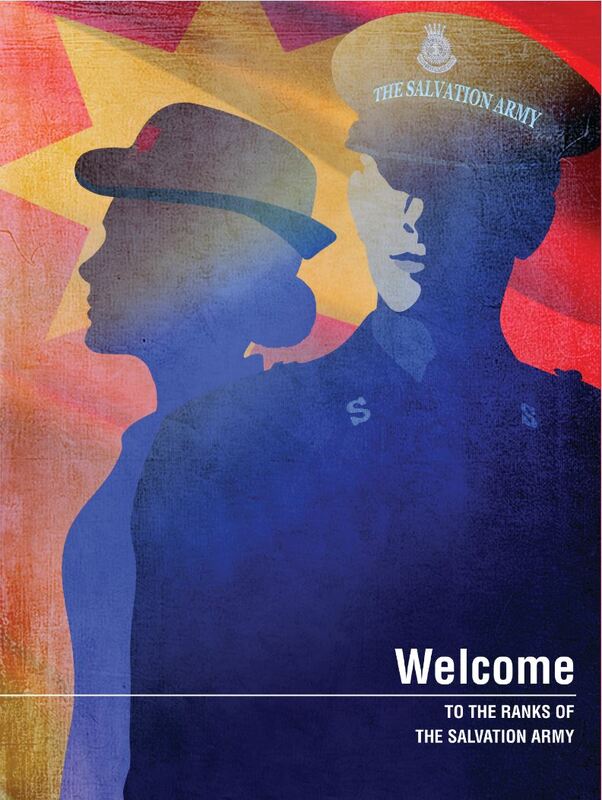 Remember that your covenant to be a soldier is completely voluntary. No one must ever feel coerced. Know at the very core of Soldiership is an unfailing belief that our God is faithful, and it is Him that we follow. May Soldiership or Adherency lead you into a richer understanding of God’s grace. Signing your Soldiership or Adherent’s Covenant is the vow of a heart bowed before God in surrender. Take time to consider this important step of faith just now. We say along with John the Baptist, “He must become greater and I must become less. As we watch this video and listen to its message, may we commit ourselves to living in the Holy Spirit’s strength- allowing our world to see Jesus in us. For those wishing to be enrolled as soldiers and adherents, make sure that a clear date is set for enrollment. Make this a significant event. Frame Enrollment Certificates. Use appropriate enrollment ceremonies. Prayerfully lead or invite guest leaders. Encourage enrollees to have family, friends, supporters present, to give their testimony, make uniform orders where appropriate. Have soldiery surround your newest members with prayer, and expressed support. This is a celebration that will be remembered for the life of the new soldier or adherent. Close in prayer. Pray a blessing over each one present- by name. BE THE ARMY THAT WILL REACH THE WORLD FOR GOD!